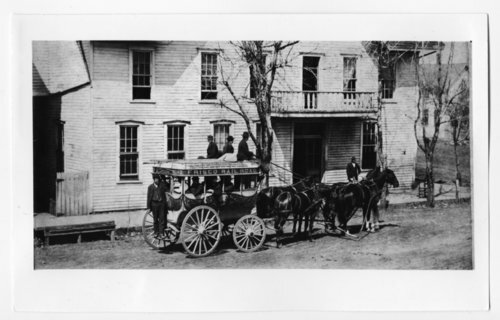 This black and white photograph shows the St. Louis-San Franciso Railway Company stage coach in front of the Oswego House, at the northwest corner of Merchant and Fourth Streets in Oswego, Kansas. The Oswego House was built by David Willims Clover. In 1867, it was a log house and the structure in the photo was completed in 1870. The coach, operated by S. A. Halsey, provided service from Oswego to Independence and then Coffeyville when the Frisco Railroad reached Oswego in 1876.